I (Gemma) moved to Scotland’s Dear Green Place at the age of 17 to attend the University of Glasgow and didn’t leave until my late 20s when I moved to the dark side, Edinburgh (I now reside in Fife). Glasgow is where I met my life-long friends, formed my political views, danced around my handbag, gained weight by eating chips n’ cheese, lost the weight running around Kelvingrove Park – when I drive into Charing Cross the same feeling consumes me, that feeling that I’m home. Personally, I don’t think one day is enough to really understand why Glasgow is special but I get time constraints, I’ve been there. This itinerary will recommend a variety of options for your day trip so you can pick and choose what suits your travel needs. Covering Glasgow’s top attractions, the appeal of the five main neighbourhoods, food recommendations, which Glasgow pubs to party at and where to get the perfect shots. In Scotland, we don’t really use the term neighbourhoods but from my extensive travel in North America, I understand categorising areas of a city is the easiest way to help visitors find their bearings. Glasgow does have distinct areas that can be zoned off making it an easy task. Beginning with the city centre you will find both train stations, Glasgow Central and Queen Street, and the Buchanan Bus Station. There are three main streets starting with Argyle Street, which runs from the West End to the East, Buchanan Street and Sauchiehall Street. You will find Glasgow’s main shops on these three streets along with bars and restaurants. The main drag of pubs and clubs is located at the top of Sauchiehall Street, after the shops. Like with all cities, you want to veer off the big streets to discover the unique pubs like the Butterfly and the Pig (mismatched furniture from your Gran’s house). Behind Buchanan Street is the upmarket Merchant City bars, clubs and restaurants as well as Strathclyde University. At the end of Argyle Street to the east is the Trongate (check out the 13th Note for vegetarian food and the Tron Theatre for shows), which takes you along the infamous Barras (weekend market, a real Glasgow tradition), passed the Barrowlands (a true Glasgow establishment which houses music gigs) and into the East End. Don’t miss Barras Art and Design (BaAd) internal courtyard for drinks and shopping, support the local shop owners by purchasing here. The East End is also home to Glasgow Cathedral, Provand’s Lordship (oldest house in Glasgow), Glasgow’s necropolis, Glasgow Green (park), the People’s Palace and two breweries. Running parallel to Argyle Street is Glasgow’s Canal. Bridges take you over to our third neighbourhood, the Southside. The Southside has its own parks, Queens and Pollok. Most of the bars and restaurants are found around Pollokshaws Road, check out the Glad cafe for vegan cakes and intimate gigs. The West End of Glasgow is where you will find most of the students in the city as well as a stylish crowd. The main street is Byres Road, which is always busy with brunchers and shoppers. Check out Oran Mor for gigs and don’t miss the cute cobbled street, Ashton Lane, for drinks under the fairy lights. In summer, you can find a beer garden on Ashton Lane and there is also a small cinema. Running along the back of Byres Road is Great Western Road, which is packed with vintage shops, furniture stores and food stops. The University of the Glasgow is found behind Ashton Lane on University Avenue. From there you can reach Kelvingrove Park (and museum) or Woodlands Road (for comedy see The Stand) down to Charing Cross and back into town. 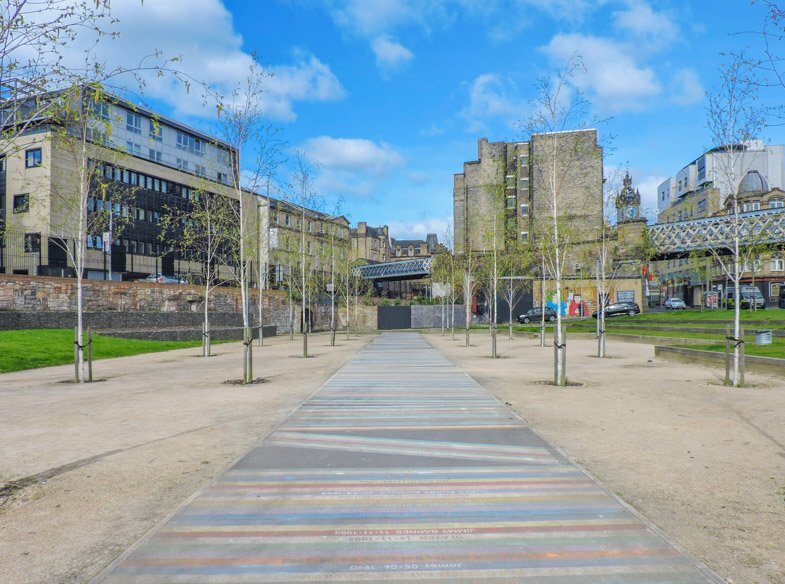 However, we are not quite finished with the West End yet because at the bottom of Byres Road you will find Argyle Street, which runs into the Finnieston neighbourhood. Finnieston used to be known purely for the Teuchter or Highlander Triangle because of the three pubs, the Park Bar, The Islay Inn and Snaffle Bit (head here to listen to trad music, especially around Celtic Connections time) but this area has exploded in the past five years. If you are in town for ethically sourced food hop into the food trucks at Dockyard Social (noodles, curries, pizzas, vegan specialities) and drinks. Finnieston Road leads to the Clyde, the Scottish Hydro, Glasgow SECC and the Transport Museum. Glasgow has an extensive network of bus routes, trains and also our beloved underground (metro, subway). Our underground is not difficult to navigate. It only goes around in one loop then back around the other way. 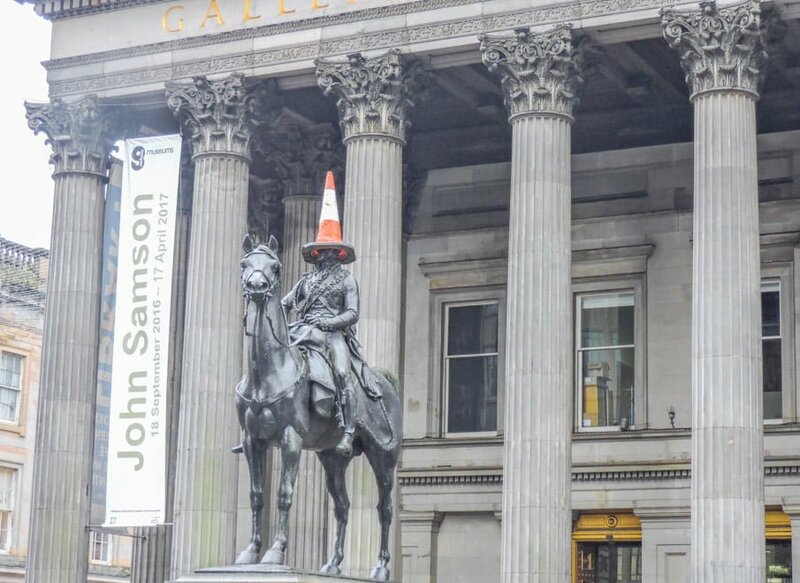 It is affectionally known as the Clockwork Orange and if you just want to spend your one day in Glasgow boozing you should play the Clockwork Orange drinking game. The game involves getting off at each stop and having a tipple! Kick off with a full Scottish breakfast or avocado and poached egg sourdough sandwich at Café Gandolfi (Albion Street), you’re going to need the energy. 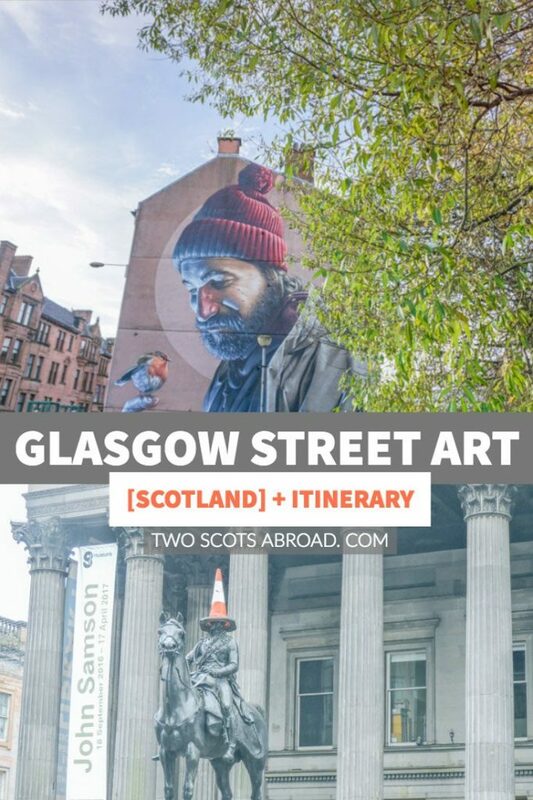 Next, it’s one of Glasgow’s points of interest, the Gallery of Modern Art (Royal Exchange Square – look out for the cone on the old Duke of Wellington) then mooch through the Merchant City keeping your eyes peeled for the street art murals. Head past the Trongate to Barrowlands Park, count the bands you’ve seen (then promise to come back to watch one live at the Barrowlands itself). Walk towards the Barrowlands, if visiting on a weekend swing by the Barras Market to experience this Glasgow institution set up by Maggie McIver who died a multi-millionaire in 1958. If you love music you will want to join the Glasgow City Music Tours run by music journalists complimenting Glasgow’s UNESCO City of Music status. Grab a bite to eat at BaAd or continue on to the next stop on your Glasgow itinerary. From here you have two options – park, palace and a pint or God’s house, the graveyard and gin. Glasgow Green is where you will find the People’s Palace, which houses a really interesting exhibition on life in Glasgow throughout the ages. Look out for the washing line poles in the Green too; these were used by locals to dry their clothes! Take a well-deserved pit stop at West Brewery (an alternative food stop to BaAd above). Walk towards Castle Street to see Glasgow’s Cathedral, tours are available (one hour long), donations are welcomed. Behind the Cathedral you will find Glasgow’s necropolis, the giant graveyard that overlooks the city. From up on the hill you will get some of the best views of Glasgow so have your camera ready. End this history tour at the oldest house in Glasgow, Provand’s Lordship, across from the Cathedral and since you are here it would be rude not to pop into St Mungo’s Museum to see the Egyptian mummy. 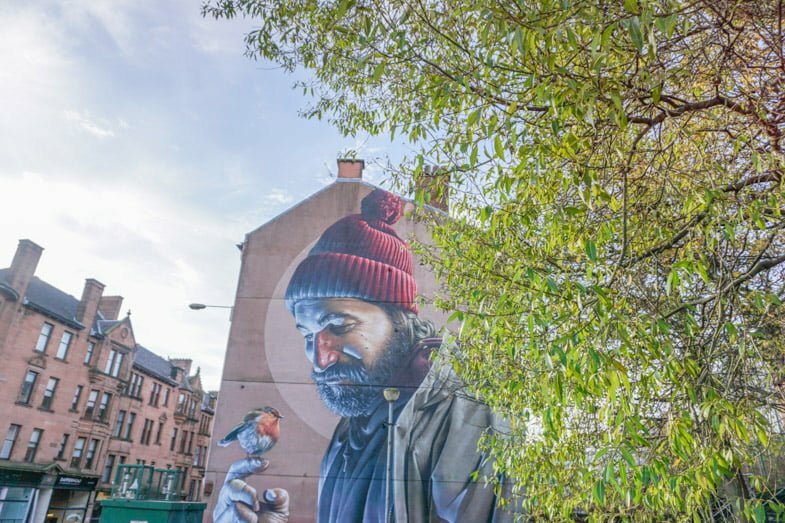 Take that extra 5-minute walk to see St Mungo himself sprayed on the end gable (not the official name of this street art mural). Head back to the Merchant City to Gin 71 and choose from one of 16 Scottish gins. Sticking around for the evening? Is it Friday? Then get yer dancin’ shoes on because Friday night is ceilidh night at Sloans. Add a meal on to make a full night of it. 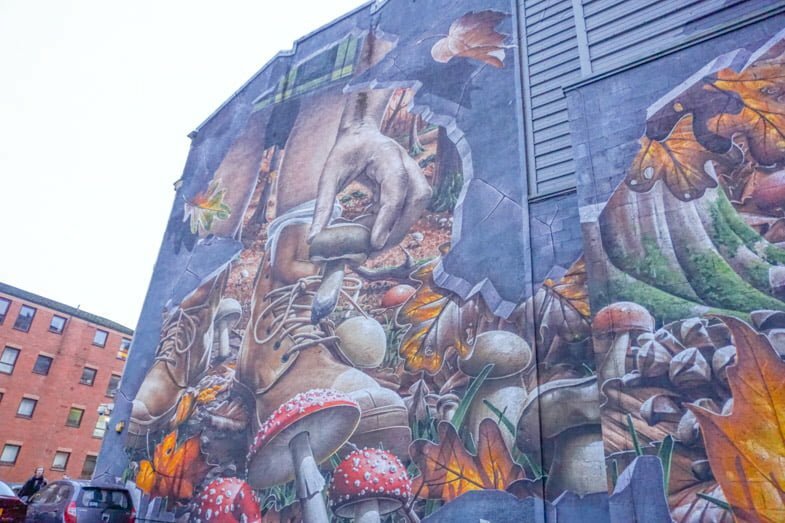 Follow above morning itinerary but after street art spotting at the Merchant City (which continues throughout the city, there are over 22 murals to discover) make your way to Argyle or Buchanan Street underground tube station (subway/metro) to Hillhead Station arriving at Byres Road in the West End. Alternatively, choose one of the afternoon options if you prioritise those Glasgow tourist attractions. Two lunch options here if visiting over the weekend. In the centre, head to the new Platform food market at the Arches on Argyle Street. The ex-dance music venue is now home to food trucks selling locally sourced food from Indian to haggis (Friday-Sunday). I recommend the surf and turf slider burger! Drinks also available and the venue is kid and dog-friendly. Or hold off for lunch until your hit the West End. Grab lunch at one of the many cafes/pubs such as Hillhead Bookclub (in town on a Sunday? Browse the vintage fair). Walk through Ashton Lane to University Avenue aiming for the University of Glasgow’s cloisters for Hogwarts vibes. 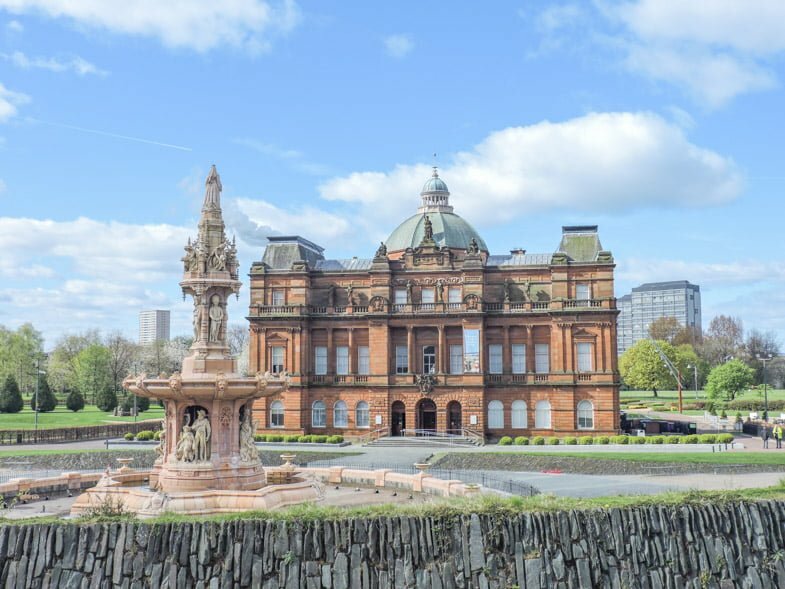 Head down the hill and take a right to Kelvin Way where you will find the Kelvingrove Museum. Browse the 22 galleries including work by Charles Rennie Mackintosh, Salvador Dali and my favourite, the Floating Heads by Sophie Caves. It’s free to enter by the way. Alternatively if finished before 15:30, head back into town for tea and cakes at the Willow Tearooms (closes at 16:00). Staying around to paint the town red? Check out Subclub for DJs, Berkley Suite Thursday-Monday dance and alternative music, Pretty Ugly for indie pop (every second Saturday), LGBT+ nights at Speakeasy Thursday-Sunday. Look out for specialist nights and events at the SGW3. So as you can see, Glasgow in a day really is a challenge but it is a nice taste of what the city has to offer. As we say in Scotland, haste ye back – and I’m confident you will return for more because Glasgow’s miles better (a reference to the 80s Glasgow tourism campaign). Have you been to in Glasgow? Any questions please don’t hesitate to comment below. Awesome, thanks for that! I’ve updated the post. Felt nostalgic writing it, still feels like home! 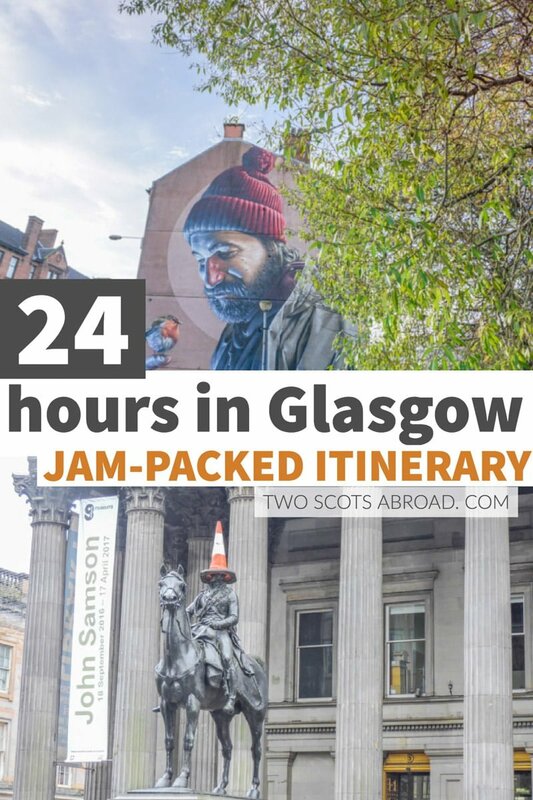 25 countries (so far) and still home is my favourite, although I’m from the North East my favourite city in Scotland is definitely Glasgow and it’s where I hope to move to when I return from this wee backpacking adventure. The people, the food (I ask for curry sauce on top of my chips and cheese haha!!) 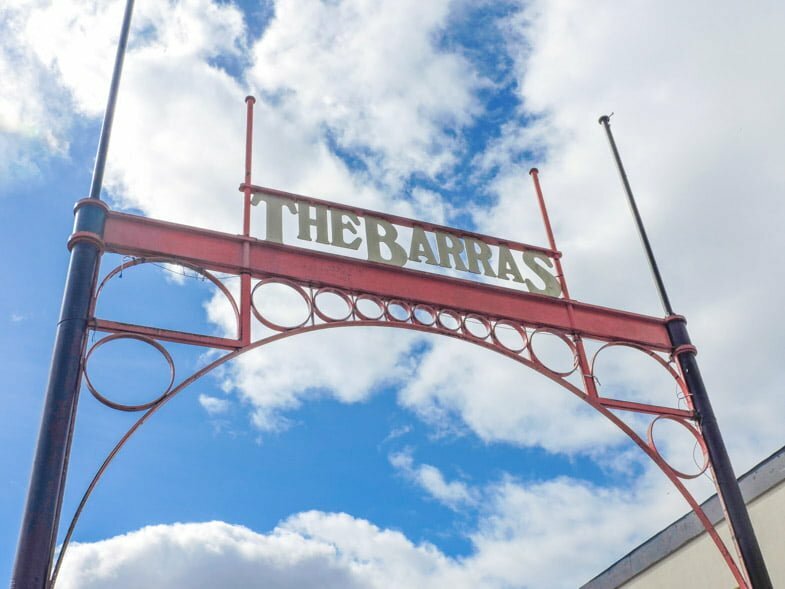 and of course the Barras, hopefully one day I can call it home like you did for many years! I agree with all of that apart from the curry sauce! After visiting Ireland last October, I can’t get that part of the world out of my mind, all the green (I’m now in the desert of Abu Dhabi). I’ve been to UK a few times, never been much north of London. But maybe this summer, I’ll get to Scotland…rent an RV (can I?). I dream of Skye. You can and should Keith! Skye is beautiful but also very busy in summer. I’m going Arran this May which will be new for me. Lewis and Harris is also said to be stunning. We did the North Coast 500 last summer, never seen anything like it (you can read about it here!) Agree, Ireland is super green and also one of the friendliest places I’ve visited and so hospitable. You have not mentioned The Glasgow school of Art, designed by Charles Rennie MacIntosh. Is it open? Hi Susan, the Glasgow School of Art suffered a second fire. You can read about it here.